"Mug books" are collections of biographical sketches usually found within county histories of the late nineteenth- and early twentieth-centuries, particularly in the United States. Each Monday, I'm highlighting ancestors or relatives who were featured in these mug books. "REUBEN W. SNOOK.--Born in Center [sic - Centre] county, Pa., June 27, 1833, and reared and educated in that sturdy old commonwealth, Reuben W. Snook brought to Forsyth, Mont., the qualities of industry and frugality for which the people of his native state are distinguished, and has put them to good and productive usefulness. His parents, Levi and Margaret (Wohlfort [sic]) Snook, were born in Pennsylvania and they there died; the former in 1879 [sic - 1889] and the latter in 1881 [sic - 1882]. Their ancestors on both sides of the family came to the United States with a Germany colony in 1684, and settled near York, Pa., where they were profitably engaged in farming for generations. [Correction: The SCHNUCH family came to Dutchess County, New York c. 1736 and the WOLFARTH family came to Berks County, Pennsylvania sometime before 1730. Reuben's maternal grandfather, Phillip WOHLFARTH, I did immigrate to York County, Pennsylvania from Berks County.] Reuben Snook remained at home working on the farm and attending the district schools in his neighborhood as he had opportunity until he reached the age of maturity. After leaving school he learned the trade of a carpenter. He worked in his native state as a journeyman and railroad bridge builder until 1883. In the spring of that year he brought his wife and children to Montana and located at Forsyth. There he followed the business of contracting and building for eight years, and erected most of the frame buildings that were put up in the early growth of the town--about forty in all. In 1893 he quit working at this trade and homesteaded a ranch on the Yellowstone which he sold soon after and removed to his present ranch, one mile from Forsyth. This ranch, compromising 168 acres, was purchased by Mr. Snook in 1890, and is devoted to horses, cattle, farming and dairying. Mr. Snook also owns valuable town property in Forsyth. In politics he is a Republican, and has rendered faithful service in various official stations. He was a justice of the peace for a number of years, was appointed public administrator in the spring of 1901, and was census enumerator in 1900 for district No. 104, then in Custer county. "Mr. Snook was married in Center [Centre] county, Pa., in 1858, to Miss Mary Walker, a native of that state, who died there in 1873 [sic - 1870]. 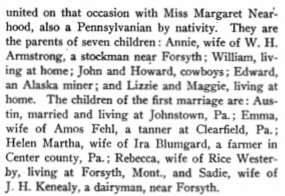 He contracted a second marriage in 1874 [sic - c. 1871], at the same place, being united on that occasion with Miss Margaret [sic - Elizabeth] Nearhood, also a Pennsylvanian by nativity. They are the parents of seven children: Annie, wife of W. H. Armstrong, a stockman near Forsyth; William, living at home; John and Howard, cowboys; Edward, an Alaska miner; and Lizzie and Maggie, living at home. The children of the first marriage are: Austin, married and living at Johnstown, Pa.; Emma, wife of Amos Fehl, a tanner at Clearfield, Pa.; Helen Martha, wife of Ira Blumgard, a farmer in Center [Centre] county, Pa.; Rebecca, wife of Rice Westerby [sic - George Rice Westaby, II], living at Forsyth, Mont., and Sadie, wife of J. H. Kenealy, a dairyman, near Forsyth." Reuben Wolhford SNOOK was my children's 4th-great-grandfather on their father's side. The above biography, while giving a detailed description of Reuben's life in Montana, is an example of how such biographies can be riddled with simple errors such as spellings and dates which are off by a few years, as well as gross errors such as the completely incorrect background on the immigration from Germany to colonial America. While I'm still sorting out Reuben's children by both wives, I do believe several children are missing from the lists detailed here. There is also a family story that says the Snooks first went to California from Pennsylvania, before heading to Montana, but so far, I've found no documents to back this up. Forsyth, Montana was originally a part of Custer County. In 1901, Rosebud County was formed from part of Custer County with Forsyth as the county seat. 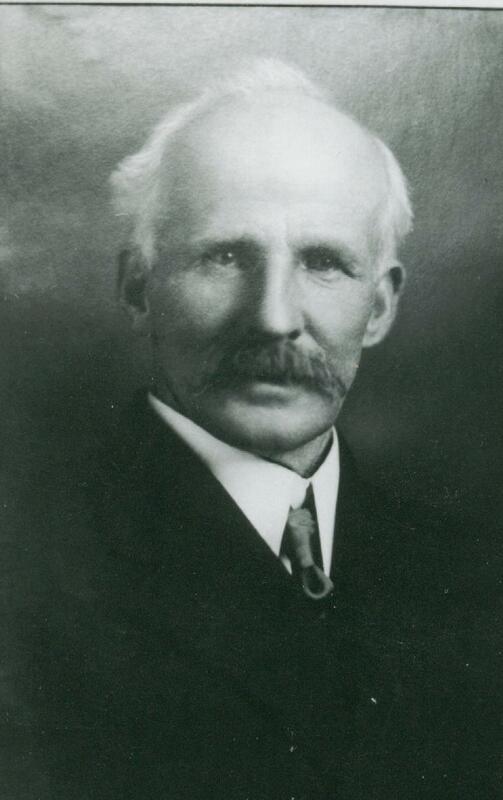 This biographical sketch was taken from Volume Part II of Progressive Men of the State of Montana, published in Chicago by A. W. Bowen and Company, c. 1902. Reuben's sketch was found on pages 1815 and 1816. This county history, along with many others, can be found at the Internet Archive. The September 2012 Scanfest will take place here at AnceStories this coming Sunday, September 30th, from 11 AM to 2 PM, Pacific Daylight Time. 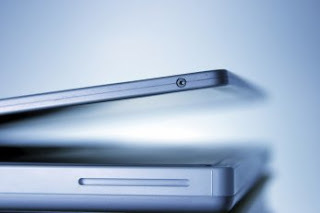 We will be using Blyve, a live blogging platform that you access right here at AnceStories. This is a new platform to us, so please be aware that there may be some technical difficulties or delays as we try out this new product. On Sunday at 11 AM, PDT, come right here to AnceStories and you'll see the Blyve live blog/forum in the top post. It's not really a "chat room," per se, it's more like a live forum and anyone visiting this site can read and see what is happening in the forum. 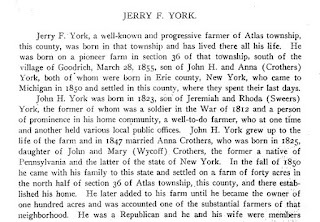 "Jerry F. York, a well-known and progressive farmer of Atlas Township, this county, was born in that township and has lived here all his life. He was born on a pioneer farm in section 36 of that township, south of the village of Goodrich, March 28, 1855, son of John H. and Anna (Crothers) York, both of whom were born in Erie county, New York, who came to Michigan in 1850 and settled in this county, where they spent their last days. "John H. York was born in 1823, son of Jeremiah and Rhoda (Sweers) York, the former of whom was a soldier in the War of 1812 and a person of prominence in his home community, a well-to-do farmer, who at one time and another held various local public offices. John H. York grew up to the life of the farm and in 1847 married Anna Crothers, who was born in 1825, daughter of John and mary (Wycoff) Crothers, the former a native of Pennsylvania and the latter of the state of New York. In the fall of 1850 he came with his family to this state and settled ona farm of forty acres in the north half of section 36 of Atlas township, this county, and there established his home. He later added to his farm until he became the owner of one hundred acres and was accounted one of the substantial farmers of that neighborhood. He was a Republican and he and his wife were members of hte Methodist Protestant church, in which he was a class leader and in which his wife served as a steward. He died on November 12, 1898, and his widow survived until February, 1904. They were the parents of seven children, of whom three are deceased, one who died in infancy, one who died when two years old and Marium, who married Henry Frick and died in 1912. The survivors are Mrs. Ella Dillenbeck, of Atlas township; Mrs. Matilda Watkins, of Goodrich; Jerry F., the subject of this sketch, and James L., who is living on the old home. 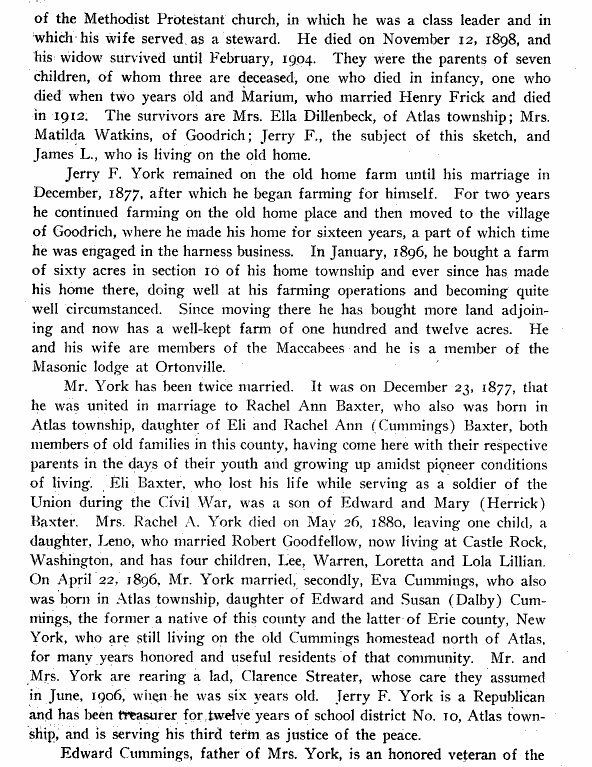 "Jerry F. York remained on the old home farm until his marriage in December, 1877, after which he began farming for himself. For two years he continued farming on the old home place and then moved to the village of Goodrich, where he made his home for sixteen years, a part of which time he was engaged in the harness business. In January, 1896, he bought a farm of sixty acres in section 10 of his home township and ever since has made his home there, doing well at his farming operations and becoming quite well circumstanced. Since moving there he has bought more land adjoining and now has a well-kept farm of one hundred and twelve acres. He and his wife are members of the Maccabees and he is a member of the Masonic lodge at Ortonville. "Mr. York has been twice married. It was on December 23, 1877, that he was united in marriage to Rachel Ann Baxter, who also was born in Atlas township, daughter of Eli and Rachel Ann (Cummings) Baxter, both members of old families in this county, having come here with their respective parents in the days of their youth and growining up amidst pioneer conditions of living. Eli Baxter, who lost his life while serving as a soldier of the Union during the Civil War, was a son of Edward and Mary (Herrick) Baxter. Mrs. Rachel A. York died on May 26, 1880, leaving one child, a daughter, Leno, who married Robert Goodfellow, now living at Castle Rock, Washington, andhas four children, Lee, Warren, Loretta and Lola Lillian. 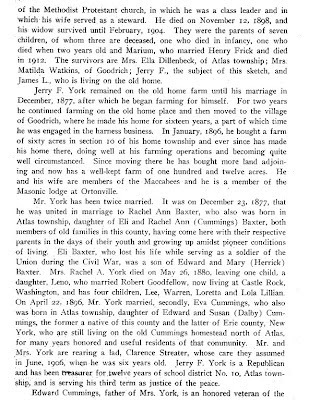 On April 22, 1896, Mr. York married, secondly, Eva Cummings, who also was born in Atlas townshp, daughter of Edward and Susan (Dalby) Cummings, the former a native of this county and the latter of Erie county, New York, who are still living on the old Cummings homestead north of Atlas, for many years honored and useful residents of that community. Mr. and Mrs. York are rearing a lad, Clarence Streater, whose care they assumed in June, 1906, when he was six years old. Jerry F. York is a Republican and has been treasurer for twelve years of school district No. 10, Atlas township, and is serving his third term as justice of the peace. "Edward Cummings, father of Mrs. York, is an honored veteran of the Civil War and for many years one f the most influential residents of his part of Genesee county. He was born on a farm in section 3 of Atlas township, January 22, 1844, son of Lewis and Elsie (Cummings) Cummings, both natives of Erie county, New York. Lewis Cummings was born in 1814, son of Stephen Cummings and wife, the former of whom was a solder in the War of 1812, and grew to manhood on a farm in his native county. There he married Elsie Cummings and in 1836 came to the then Territory of Michigan with his wife and two children, Rachel and Orlando, and settled on a tract of four hundred acres in section 3 of Atlas township, this county, which he had picked out ona previous trip to this part of the country, and there he and his family established their home in a little log house, being among the very earliest of the settlers of that part of Genesee county. Lewis Cummings was a good farmer and a man of excellent judgment and prospered in his affairs, until he presently came to be regarded as the wealthiest man in Atlas township, the owner of six hundred and forty acres of fine land and ever interested in movements having to do with the advancement of the community of which he was from the very first one of the leading factors. He was for many years member of the Congregational church at Goodrich and was ever foremost in local good works, so that at the time of his death on October 1, 1883, he was widely missed in that community. Lewis Cummings was thrice married, his first wife, Elsie, having died in 1851, leaving seven children, four sons and three daughters, Orlando, Oscar, Stephen, Edward, Rachel, Loretta and Elsie. "When the Civil War broke out Edward Cummings was still in his teens, but he enlisted for service in the Union army and served until the close of the war as a member of Company I, Thirtieth Regiment, Michigan Volunteer Infantry. Upon the completion of his military service he resumed his place on the old homestead farm in Atlas township and has lived there ever since, the owner of two hundred and twenty acres of his father's considerable estate. On April 19, 1866, he was united in marriage to Susan Dalby, who was born about twelve miles from the city of Buffalo, in Erie county, New York, in 1839, daugher of Benjamin and Sarah C. (Paxton) Dalby, the former a native of Pennsylvania and th latter of New York state, who came to Michigan with their family in 1855 and located about twelve miles south of Pontiac, whence they moved to Goodrich, in this county, where Benjamin Dalby conducted a blacksmith shop the rest of his life, his death occurring about 1871 and that of his widow in the spring of 1888. On April 19, 1916, Mr. and Mrs. Cummings celebrated their golden wedding anniversary and were the recipients of heartfelt congratulations on the part of their hosts of friends in this county. During her earlier years Mrs. Cummings was a school teacher in this county, having taught sixteen or seventeen terms of public and private, or 'select' school, and amonght ehosts of youngsters who learned their letters under her careful tutelage was the editor of this history, who has never ceased to entertain the highest regard for his old teacher." This is indeed a long biography! 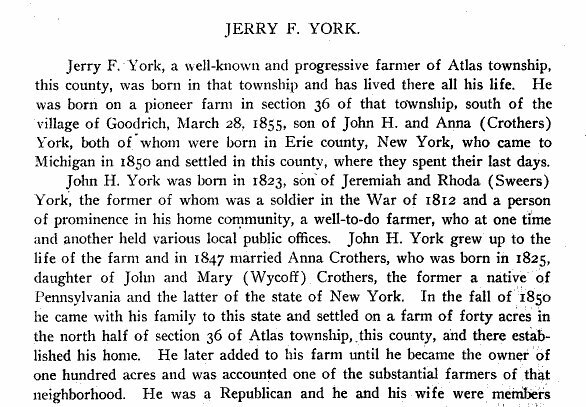 Although Jerry YORK was not my ancestor, he was the older brother of my great-great-grandfather, James L. YORK, who is given a brief mention at the end of the second paragraph. He was named for his paternal grandfather, Jeremiah F. YORK, I, and was frequently called "Jerry". Jerry's ancestors, John H. YORK, Anna CROTHERS, Jeremiah F. YORK, I, Rhoda SWEERS, John CROTHERS, and Mary "Polly" WYCKOFF are all my ancestors and are mentioned here as well. This biography may sound familiar, since the one of Jerry's father, John H. YORK, was featured in last week's Mug Book Monday. This biography was published 24 years later, so there is updated information from his father's; namely, the deaths of his parents and sister Marium. There is a great deal of information on the CUMMINGS family in this biography, since both of Jerry's wives were CUMMINGS descendants and were first cousins to one another. This is a great example of paying attention to those families who intermarried with your own, because by tracking them, you can often track immigration trails and further your own research. 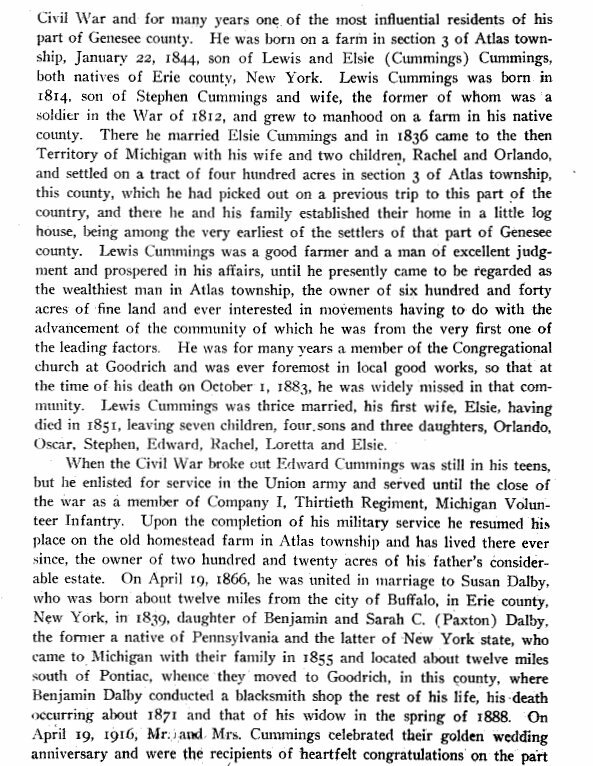 The CUMMINGS family lived near the YORK family in the Town of Clarence, Erie County, New York, before both families migrated to Atlas Township, Genesee County, Michigan. Also noted is that both Stephen CUMMINGS and Jeremiah F. YORK, I served in the War of 1812. It's possible they served together, although I have not found information to prove so. What I have discovered is that many New York War of 1812 Veterans moved to the western part of the state after the war, notably Niagara and Erie Counties, having previewed the land while being stationed at Black Rock near present-day Buffalo. This was the case for my Jeremiah F. YORK, I, who had originally been from Saratoga County, New York in the eastern part of the state. 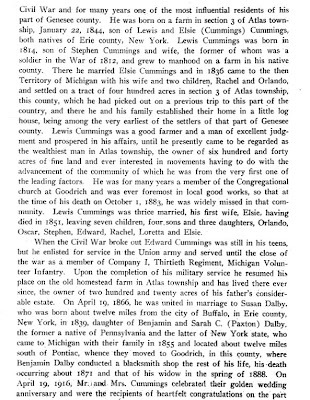 This biographical sketch was taken from Volume II of History of Genesee County, Michigan: Her People, Industries and Institutions With Biographical Sketches of Representative Citizens and Genealogical Records of Many of the Old Families by Edwin O. Wood, LL. D., President, Michigan Historical Commission, published in Indianapolis by the Federal Publishing Company, 1916. Jerry's sketch was found on pages 609 through 612. This county history, along with many other Michigan ones, can be found at the Michigan County Histories and Atlases Digitization Project website. John Dennis Concidine. Bef. 1925. Original photograph privately held by Catherine Robbins, [ADDRESS FOR PRIVATE USE], Coopersville, Michigan. 2012. "JOHN H. YORK. Our readers will be pleased to find upon this page a sketch of one of the most worthy and venerable citizens of Atlas Township, Genesee County. This septuagenarian is a representative of the best class of our citizens, and is a native of Erie County, N. Y. His birth took place December 27, 1823 and he is a son of Jeremiah and Rhoda (Sweers) York, the latter being a native of Vermont and the former a soldier in the War of 1812. "From early youth John York was engaged in the work of a farmer and received his education in the district schools of his native county. His father was a prominent man in his township and served as Constable, Collector and Deputy Sheriff for eleven years. "Our subject was married March 11, 1847 to Anne [sic - Anna] Crathers, who was born in Erie County, N. Y. December 11, 1825, and was a daughter of John and Mary (Wycoff) Crathers. The father was a Pennsylvanian and the mother a native of the Empire State. Seven children have blessed the home of our subject and five are now living, namely: Marian, wife of Henry Frick; Jeremiah; Ellen, now Mrs. Alton Dillenbeck; Matilda, who married Charles Watkins; James. Milton and John N. are deceased. "In the fall of 1850 Mr. York removed with his family to Genesee County, and settled upon the farm where he now lives, a property which was then only partially improved. Upon this he has bestowed great labor and has it now in an excellent condition. It comprises one hundred acres of some of the best land in the county and it is in a highly productive condition. All this is the result of the united efforts of our subject and his wife, who have labored shoulder to shoulder through the hard times of pioneering and together have accumulated a property which provides well for them in their old age. "Mr. York has served as School Director and is active in promoting all educational movements. 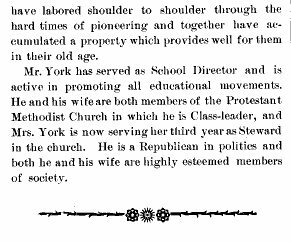 He and his wife are both members of the Protestant Methodist Church in which he is Class-leader, and Mrs. York is now serving her third year as Steward in the church. He is a Republican in politics and both he and his wife are highly esteemed members of society." John and his wife, Anna CROTHERS (CRATHERS is an alternate spelling) were my 3rd-great-grandparents. It is believed that both of them were born and married in what is now the Town of Clarence in Erie County, New York. Listed in this biography are four of my 4th-great-grandparents: Jeremiah F. YORK, I; his wife Rhoda SWEERS; John CROTHERS; and Mary "Polly" WYCKOFF. Also listed is my 2nd-great-grandfather, James L. YORK, John and Anna's son. Finding this biography many years ago was like winning the lottery, as John's great-granddaughter, who was my paternal grandmother, was an adoptee, and I was building this family tree from scratch, with little information. I used this biography for a spring board to check vital and census records, land records, and to order Jeremiah's War of 1812 Veteran's Pension Record from the National Archives, which provided me with even more material. The land in Genesee County that John farmed was originally claimed by his (presumed) uncle Stephen YORK as part of his bounty land for serving in the War of 1812, although it appears that Stephen never resided on it, but remained in Erie County, New York. This biographical sketch was taken from Portrait and Biographical Record of Genesee, Lapeer and Tuscola Counties, Michigan, containing Biographical Sketches of Prominent and Representative Citizens, together with Biographies of all the Governors of the State, and of teh Presidents of the United States, published in Chicago by the Chapman Brothers, 1892. John's sketch was found on pages 600 and 601. This county history, along with many other Michigan ones, can be found at the Michigan County Histories and Atlases Digitization Project website. Four of Five Children of Robert Louis and Jeanne Marie (Holst) Robbins. 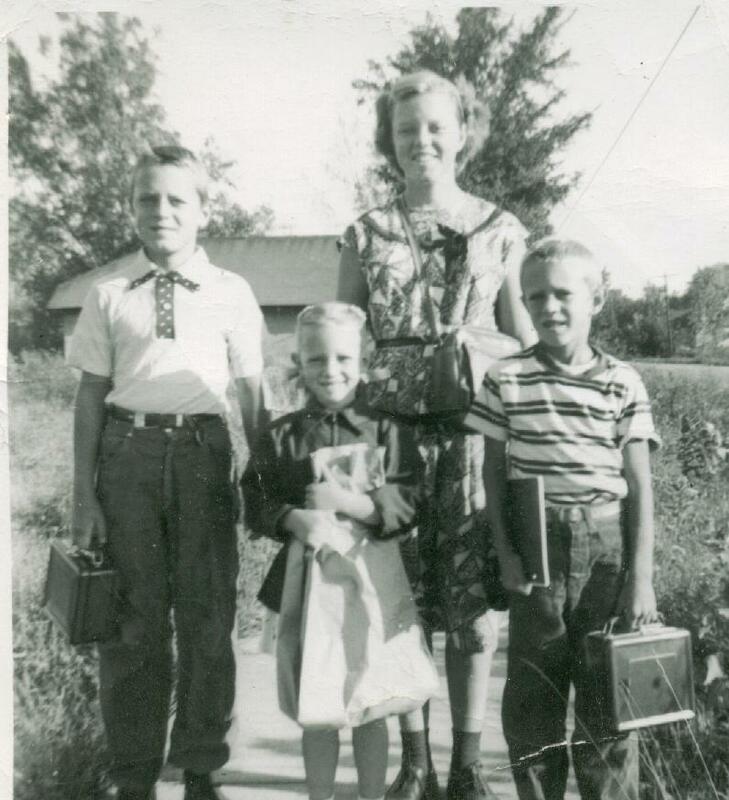 First Day of School, Coopersville, Michigan. September 1955. Original photograph privately held by Catherine Robbins, [ADDRESS FOR PRIVATE USE], Coopersville, Michigan. 2012. Ezra Dickenson [sic], a retired farmer of Auburn, was born in Sharon, Litchfield Co., Conn., Aug. 26, 1798. He was reared a farmer, living with his parents till his majority. 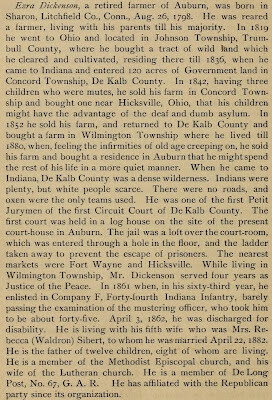 In 1819 he went to Ohio and located in Johnson Township, Trumbull County, where he bought a tract of wild land which he cleared and cultivated, residing there until 1836, when he came to Indiana and entered 120 acres of Government land in Concord Township, De Kalb County. In 1842, having three children who were [deaf] mutes, he sold his farm in Concord Township and bought one near Hicksville, Ohio, that his children might have the advantage of the deaf and dumb asylum. 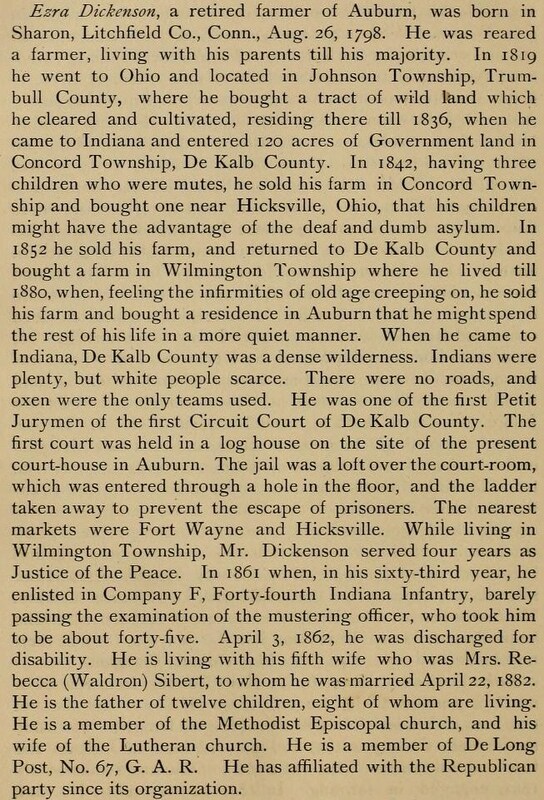 In 1852 he sold his farm, and returned to De Kalb County and bought a farm in Wilmington Township where he lived till 1880, when, feeling the infirmities of old age creeping on, he sold his farm and bought a residence in Auburn that he might spend the rest of his life in a more quiet manner. When he came to Indiana, De Kalb County was a dense wilderness. Indians were plenty, but white people scarce. There were no roads, and oxen were the only teams used. He was one of the first Petit Jurymen of the first Circuit Court of De Kalb County. The first court was held in a log house on the site of the present court-house in Auburn. The jail was a loft over the court-room, which was entered through a hole in the floor, and the ladder taken away to prevent the escape of prisoners. The nearest markets were Fort Wayne and Hicksville. While living in Wilmington Township, Mr. Dickenson served four years as Justice of the Peace. In 1861 when, in his sixty-third year, he enlisted in Company F, Forty-fourth Indiana Infantry, barely passing the examination of the mustering officer, who took him to be about forty-five. April 3, 1862, he was discharged for disability. He is living with his fifth wife who was Mrs. Rebecca (Waldron) Sibert, to whom he was married April 22, 1882. He is the father of twelve children, eight of whom are living. He is a member of the Methodist Episcopal church, and his wife of the Lutheran church. He is a member of DeLong Post, No. 67, G. A. R. He has affiliated with the Republican party since its organization. Ezra was my fourth-great-grandfather. His first wife, Cynthia PHILLIPS, was my ancestor, as was their daughter, Lucy May (DICKINSON) KIMBALL, who is one of the four children deceased by the time this sketch was published. Several years ago, I highlighted Ezra's Civil War service here. This biographical sketch was taken from History of De Kalb County, Indiana, together with sketches of its cities, villages and towns, educational, religious, civil, military, and political history, portraits of prominent persons, and biographies of representative citizens, published in Chicago by Inter-State Publishing Co., 1885. Ezra's sketch was found on page 864. This county history, along with many others, can be found at the Internet Archive.